Digging through some boxes in my garage, I came across a collection of papers I had earlier set aside concerning the famous "UFO abduction" case of Betty and Barney Hill, the subject of John Fuller's 1965 book The Interrupted Journey, as well as the 1975 NBC-TV movie The UFO Incident. Correspondence between Dr. Benjamin Simon and arch-skeptic Philip J. Klass. Correspondence between Betty Hill and Philip J. Klass, in which she attempts to persuade Klass that her abduction story is factual. Correspondence between Dr. Benjamin Simon and yours truly (!!). Copies of the supposed "radar evidence" of the Hills' UFO. 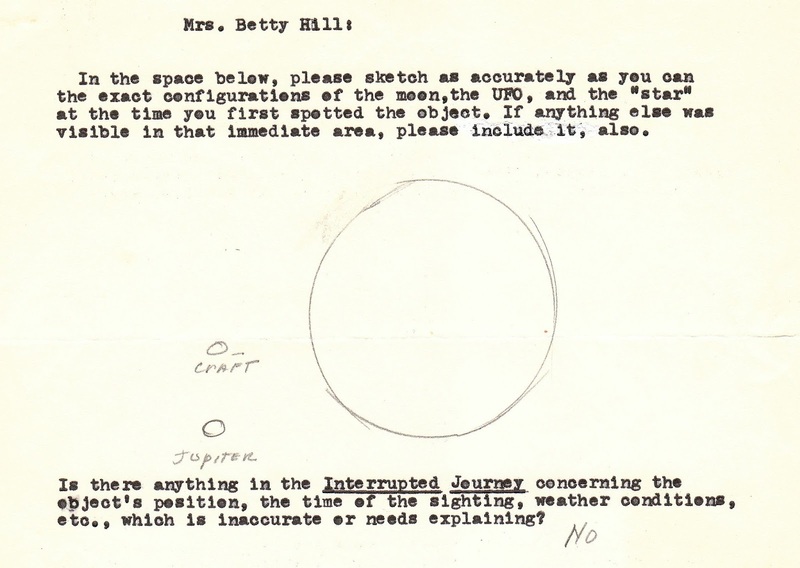 Betty Hill's drawing illustrating the relative positions of her "UFO" and what she is calling "Jupiter", and the moon, establishing that it was actually Jupiter she saw at the beginning of her sighting. My skeptical article about the Hill case, published in the August, 1976 issue of Official UFO magazine, and Betty Hill's letter to the editor about it. The complete record of weather observations for Sept. 19-20, 1961 from the Mt Washington Observatory, the highest point in New Hampshire's White Mountains. [Kathleen] Marden [Betty Hill's niece, and currently the biggest promoter of the Hill abduction story] suggested in a provate email to me, "Had Dr. Simon stated publicly that he believed that the Hills had experienced an abduction by non-human beings in a flying saucer, it would most assuredly have been professional suicide." However, Marden said that in his personal letters to Betty Hill, Dr. Simon was positive and fully supportive of Betty. The abduction did not take place but was a reproduction of Betty's dream which occurred right after the sighting (p. 3). Dr. Simon's skepticism concerning the abduction story could not have been more directly stated. 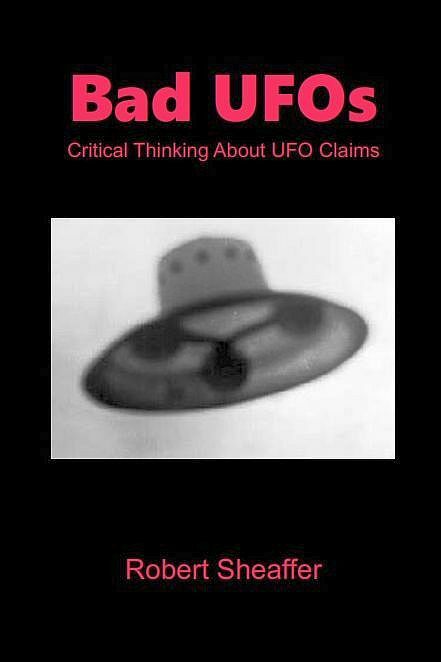 He told Klass that "my interest in UFOs was almost entirely on the phenomena of Barney's developing racial paranoia which seemed to me to have been the best representation on the matter I had seen" (p. 8). why was it left to Mr. Klass to reveal that the psychiatrist who treated Betty and Barney Hill (The Interrupted Journey) never for a moment believed that they had been inside a flying saucer, while Look magazine used his misquoted words as an endorsement? (p. 10). Dr. Simon wrote to Klass, "THE ZEITGEIST HAD COME!, and I determined that this could be a magnificent opening for the book I am going to write on this whole matter." Unfortunately, no such book was ever written. Is it possible that Dr. Simon left behing a partially-completed manuscript at the time of his death? Betty Hill's sketch of the positions of the objects she said she saw. What she is calling "Jupiter" is obviously Saturn, and what she calls a "craft" is obviously Jupiter. (Size of moon is exaggerated.) 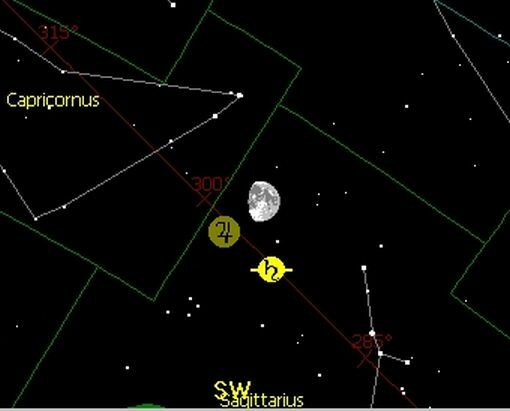 If some other object were present, she would have seen three objects near the moon, not two. Everyone interested in the Hill case will want to see these newly-published documents.